Air management expert Mansfield Pollard has strengthened its growing relationship with Skipton Girls’ High School by sponsoring the school’s first-ever engineering award. The annual prize giving event recognises the academic achievements and personal triumphs of the higher education students of Skipton Girls’ High School. 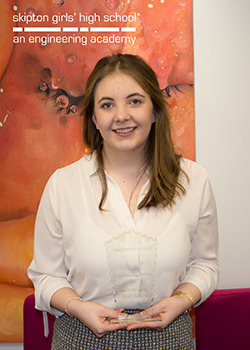 A wide range of awards were handed out to the top achievers, with Mansfield Pollard sponsoring the school’s first-ever engineering award, won by Katie Askew. Throughout the Engineering course, Katie always maintained a very strong work ethic, learned how to overcome obstacles and completed all her work with diligence. These are the key attributes of any engineer and the school’s curriculum leader, Paul Braden, was in no doubt about who should win the award. By nurturing links with Skipton Girls’ High School, Mansfield Pollard is further strengthening its position as an employer of choice in the area and continuing to promote the message that the manufacturing and engineering sector can provide stimulating and fulfilling careers. Paul Braden said: “Being an Engineering Academy, Skipton Girls' High School wanted to recognise students’ efforts and determination and to encourage their progression to continue into the world of engineering, be it at university or Advanced Apprenticeships. We desperately need more female engineers, scientists, and mathematicians, as they currently only represent a very small percentage in this field. “As we continue to build a very strong relationship between Mansfield Pollard and Skipton Girls' High School, the opportunities that Mansfield Pollard have provided for our students are invaluable. Through short and longer term work placements, support with coursework and attending events at school, the world of engineering has very much been brought into the school setting to show real life experiences.